Great points Fatty. You forgot is between limes and carbon fiber on the list: Chamois Creme (Whichever brand you prefer). What a beautiful dog! 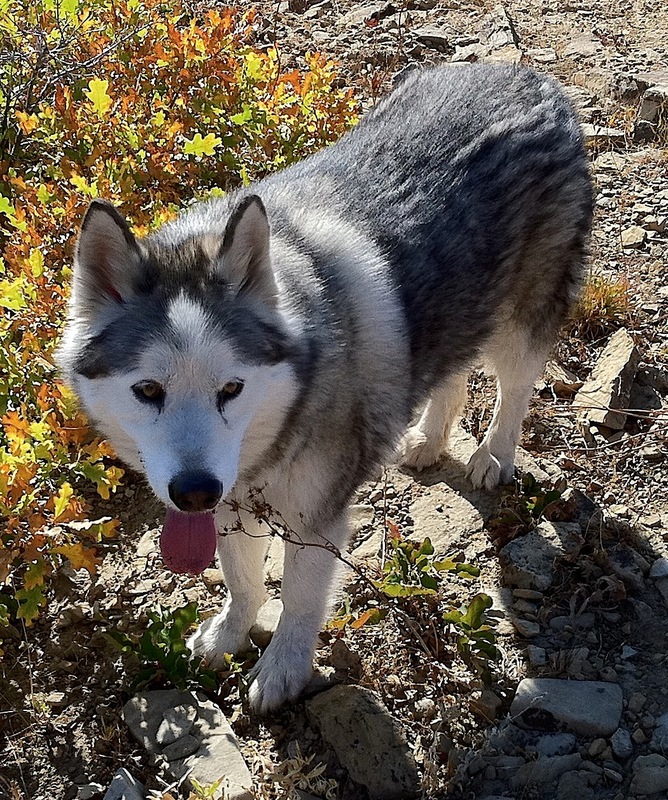 My aunt had a malamute/huskie mix and he was gorgeous! Nice list, love the dog we’ve got a Husky that loves to walk the mixed use trails with me. 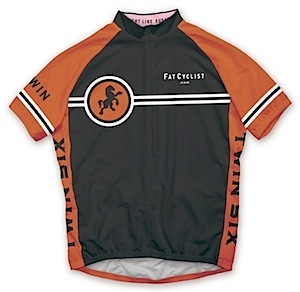 I’m also thankful for the 25% off sale because I have no excuse to not purchase a fine Twinsix Team Fatty jersey. I too am thankful. What started out as an extremely difficult year has turned out wonderfully. Thanks to you all for your support, donations and help through the kidney transplant journey. We are all well, thriving and are especially thankful this has passed! We are thankful in the Fatty family for 4 new babies that were born during the last month too. Fatty’s sisters had 3 and a niece had 1. A great way to end a hard year. Happy Thanksgiving to you all and thanks again for all of your giving! I’m thankful for the most awesome family in the world and the health we all have to enjoy it. I am thankful that this country excludes skinny people from being able to buy properly fitting clothing. It saves me from spending $56 on a jersey. Of course, twin six only tells me it is out of stock after I put in my credit card information. I guess other skinny riders are faster than me both on the bike and on the keyboard. Shucks. I am thankful for Fatty,(for Elden) who brings us all together under this big tent. Who makes us laugh and cry in equal measure. Who makes us thankful for our own friends, families, children, and the memories of those no longer with us. Who reminds us that together we can win. I too am happy for the TWIN SIX 25% off sale. I was going to forgo a 2011 Fatty Kit (money’s tight) but the sale made it irresitable. Have a great Turkey Day Fatty! No matter how hard and busy we are just remember we are truely blessed! I am thankful for my wife. Without her, I would not have been allowed to open OUR wallet and dive headfirst into the cycling phenomenon over this past summer. I am hooked and I owe it to her and bibs. Have a Happy Thanksgiving. i have just bought a long sleeve fat cyclist top for winter ! at the end of summer i am thankfull for winter !!! Thank you for your blog. Whilst being very amusing and slightly informative, you let me know that no matter how bad my day is, someone is having a worse day, and most likely with a richer outlook than mine. I am thankful for my whole Fatty family. May you all have an amazing Thanksgiving!! happy thanksgiving. hope you eat alot tomorrow. I’m going to have to try the lime thing. I keep thinking I’ll like Diet Coke with Lime, but the taste just isn’t right. Thanks for the tip! So many things to thank the Lord for – His undeserved grace, great friends and family, some of whom are also good riding partners, the opportunity to go out and play on a bike… and deep fried turkey and apple pie. I am thankful for Team Fatty – for getting me through my first Century ride after I blew up going too hard too early. I am thankful for Elden and this blog. Not only have you inspired me to ride more, get fit, but you have inspired me to take up the fight. Sometimes the true meaning of this blog gets lost in all the fun and coolness. But then it never really does get lost, does it? We’re all here for the same reason. I am thankful I have found cycling this year. Not only am I more healthy than anytime in the last 20+ years, but I have made new friends, and have become part of something – Team Fatty and the fight. I can’t wait to meet some of you in person in 2011. I have no idea how you fit all that in – very impressive and awe inspiring. I’m a family guy – 2 kids, wife, full-time job, the usual. So I know how busy it can be. I also have nearby singletrack – and yes, that’s priceless. Ride from the house and hit dirt in minutes. Only thing better then that – sharing it with my 11 year old son. Happy Thanksgiving to you all!! You have been a blessing beyond description……enjoy the time with friends, family and loved ones and take a moment to reflect on what they all mean to your life. I am thankful for your happy year. I am thankful Philly Jen is happy and well. I am thankful for more than I can list. Now, less typing, more TwinSix shopping. I hope you all have a blessed day. Hey, I’m trying to buy a Fat Cyclist hoodie and there’s no discount being given. Are these items excluded? I am Thankful for celebrating Thanksgiving a month and half ago instead of this close to Christmas. I am not Thankful to be at work. Happy Thanksgiving Fatty, and to your wonderful family, along with everyone, everywhere that makes up Team Fatty. Ride – Eat – Ride Some More – Then Have Dinner! My house that is so beautiful and a place of creativity, joy and peace. My bike where I feel free, powerful and at a place of bliss. Thankful for this blog and all the people who inspire me to be a better person. I am thankful for the child doctors told me I probably would not be able to have after having cancer, he will be four in March. I’m thankful for the financial support I recieve from my parents when money is tight, I am thankful there areso many others out there joining the fight against cancer. I am thankful that the power is back on and I can again be amused and inspired by Fatty’s blog. The runner has great taste in dogs. I have a pair of malamutes that offer endless fun and amusement as well. Thanks for sharing this post. Please also do visit our club, the I AM GR8FUL CLUB. Just join us if you like it. So here’s the link. Just join us, it’s not like your losing your life in here. Thanks! Late Happy Thanksgiving, Fatty, Runner, and all Friends of Fatty on & off this blog. Listen, Fatty – ‘dog people’ need to know – What is the Malamute’s name? ‘Runners Dog’ does not cut it. “Runners’ Dog – Roll over!” See what I mean? Ok, so I am on vacation in Sorrento Italy for a week. I weighed in last week at a hefty 267 (my highest ever). I somehow have managed to weigh in at 264.2, for a loss of 2.8lbs. Started at 264, now at 259. Lost 5 so far. Hooray! Starting weight 206.5 weight 12/7/10 202.5 down 4 pounds.